11 November 2010, 6:02 PM: An email among EPA employees acknowledges a deadline citizen suit filed by two environmental special interests: Sierra Club & WildEarth Guardians. Notably, the email indicates that EPA never even considered defending its prerogatives to set its own priorities. Instead, a negotiated consent decree is assumed. 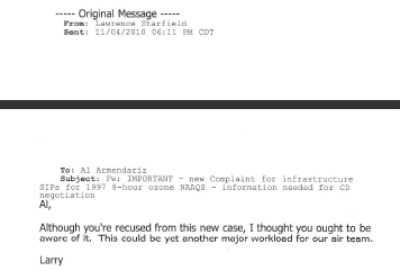 11 November 2010, 6:11 PM: Only 9 minutes after learning about the sue and settle negotiations, EPA’s Lawrence Starfield emailed EPA Region 6 administrator, in order to preemptively recuse Armendariz from the case, due to prior relationship with the Sierra Club. It is unclear what was Armendariz’s relationship with Sierra Club had been. Currently, Armendariz works for Sierra Club’s “Beyond Coal” campaign. 11 November 2010, 6:25 PM: A quarter hour later, Armendariz responded to Starfield. In his response, the EPA Region 6 administrator rejects Starfield’s conclusion regarding the need for a recusal. 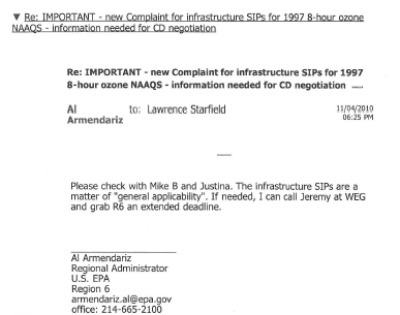 Armendariz then tells Starfielf that, “if needed” he could “call Jeremy [Nichols] at [WildEarth Guardians] and grab [EPA Region 6] an extended deadline.” Jeremy Nichols is described on WildEarth Guradians website as, “Director of the Climate and Energy Program, taking action to fight fossil fuels, promote clean energy, slash greenhouse gases.” On Armendariz’s cv, Nichols is listed as a personal reference. 11 November 2010, 10:06 AM: The next morning, Starfield responds, and lays the smack down on Armendariz. He tells the Region 6 Administrator that he is recused, period. 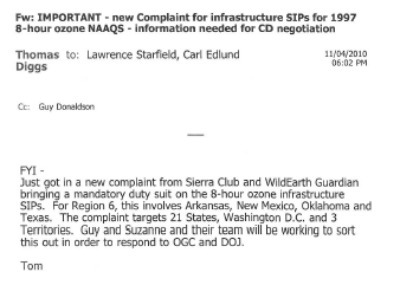 Again, Starfield cites the reason for the recusal as being Armendariz’s relationship with Sierra Club, instead of his personal relationship with WildEarth Guardians. EPA officials were aware of Armendariz’s ex parte contacts, and discussed them before alerting Armendariz that he was recused. Clearly, this was something about which EPA officials were wary. Two years ago, my CEI colleague Chris Horner filed a FOIA requesting all correspondence between Armendariz and his former colleagues regarding a major sue and settle case—WildEearth Gurdians v. Jackson—that unfolded over much of 2010. Below, I’ve reposted the documents that were responsive to that FOIA request. And below that, I’ve posted an index/timeline of the records. In that document, I lay out the case that Armendariz worked closely with WildEarth Guardians and the administration of former New Mexico governor Bill Richardson (D) in order to manipulate deadlines pursuant to the aforementioned WildEarth Gurdians v. Jackson sue and settle, and thereby ensure that Richardson’s successor, Susana Martinez (R), would not have the authority to set environmental policy at the San Juan Generating Station, a large coal-fired power plant near Farmington, New Mexico.